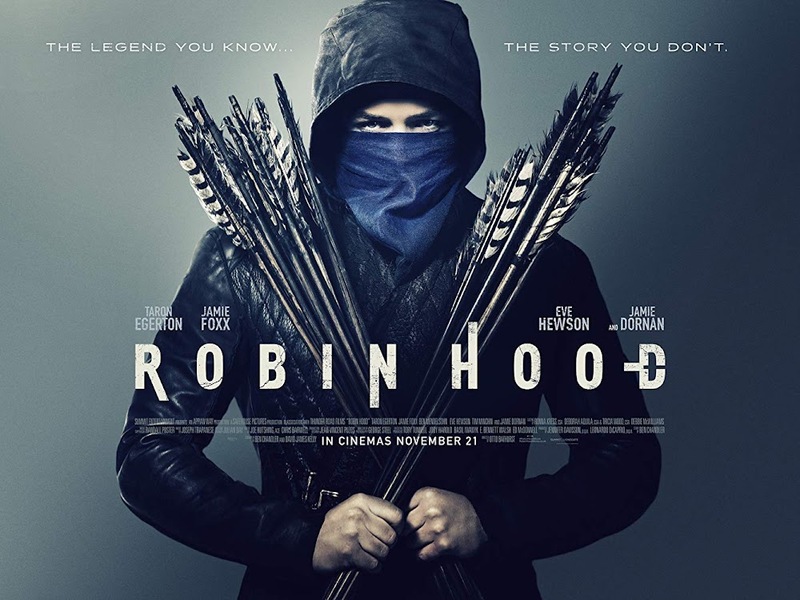 Starring Tarron Edgerton (Kingsman: The Secret Service, Rocketman) and Jamie Foxx (Django Unchained, The Amazing Spiderman 2) both star in the new spin on the classic, Robin Hood, which was in cinemas on 21st November. Edgerton playing Robin of Loxley, Foxx roling as Little John, they are joined by other well-established actors like Jamie Dornon (Fifty Shades of Grey) and Ben Mendelsohn (Rogue One, The Dark Knight Rises) to make an outstanding tale come to life. Robin of Loxley meets his maiden, Marian (Eve Hewson) in the beginning of the film, when she tried to steal one of his horses. The love story then takes a sour turn as Robin is sent off to become a Crusader in the war. After some amazing bow and arrow skills, it is made clear that Robin has established the trust of enemy, John after trying to save his son from murder. Upon his arrival back in Nottingham, Robin discovers that he was declared dead, by the Sheriff of Nottingham (Ben Mendelsohn) two years ago, by his friend Friar Tuck (Tim Minchin) and that his beloved Marian has moved on with political enforcer, Will Scarlet (Jamie Dornan). After the heart breaking news, John takes Robin under his wing and mentors him to become a thief in order to take back Nottingham from the Sheriff who uses his takings of money from the poor as power for himself. Robin of Loxly now has an alter-ego of The Hood. In the day, he is the well-established Lord who is trying to gain the trust of the Sheriff, by night his is a hero to the poor, stealing riches to give to the poor and end the Sheriff's reign. After discovering the groundbreaking news, Marian and Friar Tuck help Robin and John carry a revolt against the Sheriff. The big climax is definitely one that will keep you on the edge of your seat, the ending even more so. You can watch the trailer below. I've said a lot about the film but I haven't given away enough details to ruin it. There is definitely a lot more excitement than a few robberies and a revolt but you'll just have to go and watch it to find that out (I recommend watching at the Odeon as they now have tickets from £5!). This film was meant to be released last year but was put on hold and it was worth the wait. Before I watched this film, I saw a video online of Tarron Edgerton learning to shoot three arrows at a time and I was impressed. He does all of the bow and arrow stunts himself. If this isn't enough to amaze you, I don't know what is. You can watch the video below - it's only a short one but it's mad! The film itself has some scenes with amazing cinematography in it (inner media student is fangirling) and I really enjoyed those. I think that the film as a whole was brilliant including the storyline. It's not everyday you turn an old tale into something as exciting and thrilling as this. The tale of Robin Hood is one that most people know and this film has taken that, putting a spin on it. There wasn't one time in this film where I was bored (usually there is) and there were twists and turns that I never saw coming. You can truly immerse yourself in this film. All of the castings were brilliant, I couldn't fault one performance. The roles were carried out effectively, making me believe that these events could really be true. Some think that the story of Robin hood is a myth, others believe it is true - from this film, I actually believe in the tale of Robin Hood. There was only one thing that I picked up on in the film that irritated me, and that was the costumes. I don't believe heels that look like they've just walked out from Selfridges is a true representations of what wealthy women would have worn in this time, and suits that could have just come off of the red carpet also. I really liked how some of the costumes were more of a true to form and some had a more modern twist but I really don't think there was enough consistency. I think that this is a brilliantly crafted film that will capture it's audience, taking it on a journey that we all know and love but adding in a few curveballs that make the tale just that little bit more exciting. Robin Hood is a classic tale and the filmmakers have put a more modern and twisted spin on it which I think works really well - if the costumes were more consistent, than this would have made the film that little bit better. This film is a definite recommend from me.